US stocks continue to trade sideways, while spot VIX languishes. 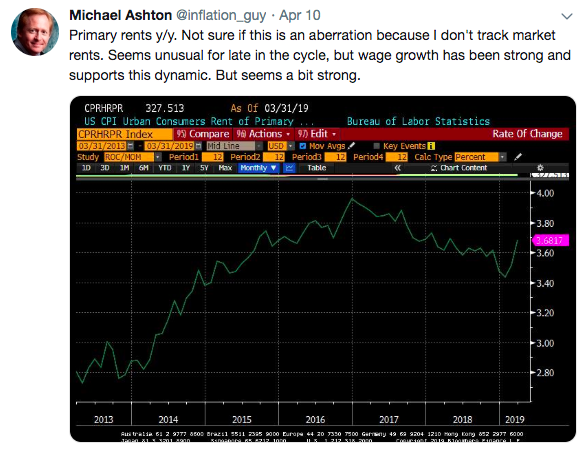 Rents make up a large portion of US CPI calculations, and they're still firing on the high side. Today's term structure looks almost identical to that of four weeks ago, and we have managed to see some modest fireworks in the interrim. Try though it may, the US stock market (SPY, DIA, QQQ, IWM) is having difficulty moving much at all over the past week. 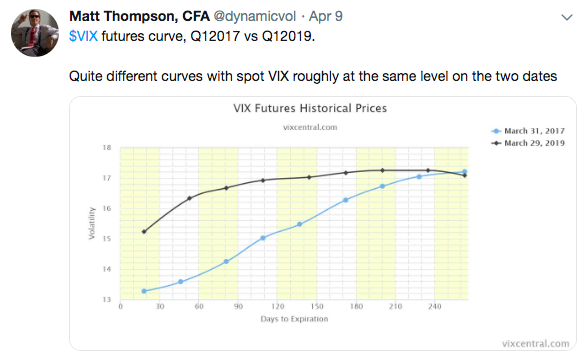 Spot VIX looks to be setting up to foray into lower handles. Yesterday's release of the Fed minutes provided at least a possible reason for stocks to move, but apparently markets didn't find any noteworthy surprises as they parsed the text. Markets may (or may not) act rationally, but even if they do, it sure doesn't mean that they cannot surprise us! Should this be deemed a triumph of the Troika? 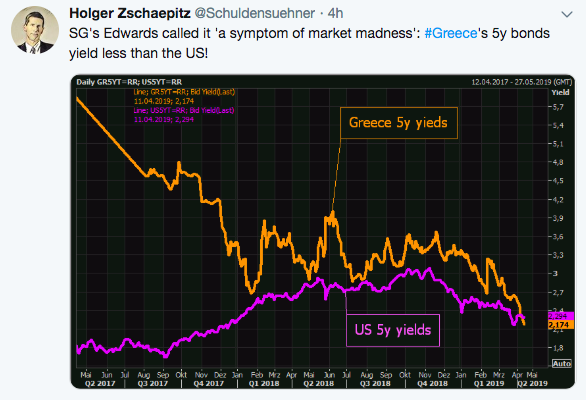 One has to question how "natural" these yields are on Greek sovereign debt. On the other hand, why does it really matter? If investors have rational expectations that the debt is effectively guaranteed, then the issuing nation doesn't really matter. Examples such as this do, however, suggest that we have re-entered a period where investors are shrugging off risk and instead hungry for yield. Rents (even estimates of what rents would be if homeowners had to rent their homes) makes up the largest segment of the Bureau of Labor Statistics CPI calculation (around 1/3rd, though this changes slightly from year to year). The Fed is on hold, but this important weighting in the consumer basket of expenditures could play a role in the monetary body having to reassess their stance to keep rates where they are. Such a shift would likely have important ramifications on the volatility structure of the financial markets. I'll share more on this in the "Term Structure" section, but the end of last month's term structure is pretty stinkin' different from that of its end-of-March counterpart for 2017. This mostly comes down to differences in realized vol, as well as the abandonment of the "short vol, early and often" mantra that came into vogue in late 2016 shortly after the US presidential election. Today we have a more flexible term structure, as the volatility market is arguably more balanced than it was in March 2017. Once again referencing the visual by Matt Thompson, observe that the March 28th term structure (he used March 29th) is actually in the middle of what we've seen over the last few weeks (I've chosen each Thursday's close between March 7th up until the present, as well as Friday, March 22nd). 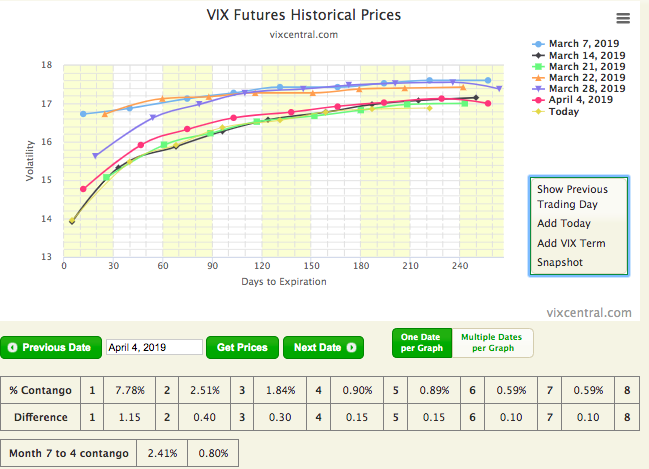 The term structure over the last couple months has generally trended toward lower levels of implied volatility, as well as steepening contango. This is a typical pattern to observe in light of how realized volatility has tanked. Note that the term structure on March 14th (which is almost identical to today's shape) was significantly closer to the term structure of late March 2017. The two major differences between then (EOM '17) vs today in the term structure is that the overall gap between the front month and the back month was somewhat wider back then, and also the fact that today's term structure is more concave at the front end, swiftly flattening after the fourth month. I think that it's entirely possible to end up with a front month hanging out around 13 in today's environment. In fact I'd go so far as to call it my base case for next week as the contract approaches expiration. Between the death of XIV (Feb '18), deleveraging of UVXY and SVXY (late Feb '18), and the maturity of the VXX and VXZ notes (Jan '19), the last year or so has been one of great transition for vol-related ETPs. Thank you to readers for providing heads-up and also useful tips on how to track data as these changes come up. Across the pond, vol is wilting also. We have seen plenty of instances where volatility temporarily throttles higher (see the spikes in late Jan), but the VIX of EFA, which often trades at a discount to SPX VIX, is now tracking below an 11 handle. This index managed to find a way to print in the 8s last summer. For those who believe it's "too quiet" out there, there is at the very least plenty of precedent for the calm to continue, and the US markets are by no means alone at present while participants in risk markets cannot for the life of them think of anything to worry about. 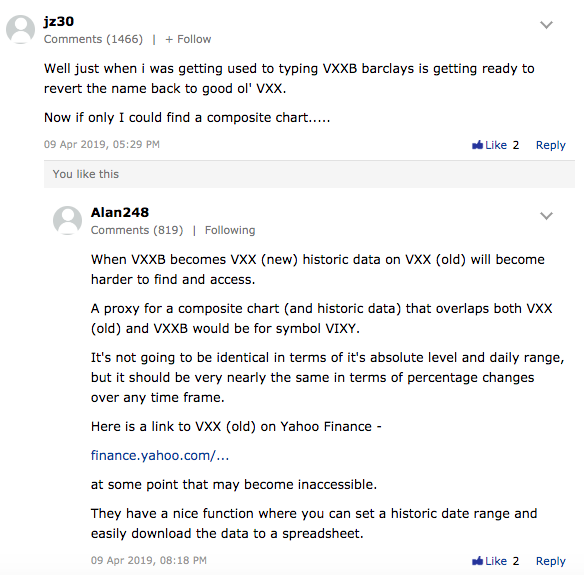 There were plenty of excellent comments in the most recent MVB, and Silent Trader brings up the really important point that a lot of the good news of accommodative has arguably been priced in. 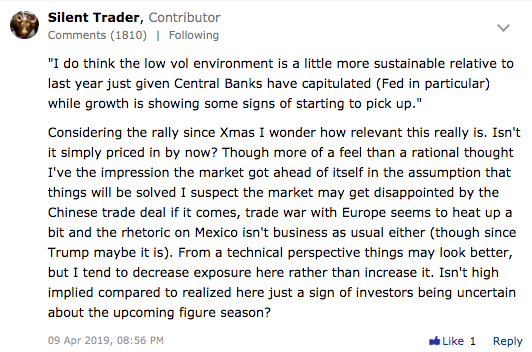 I like the distinction he's making in the comment between the technical picture (higher highs, higher lows) vs. the fact that many of the issues that caused consternation a couple quarters ago are truly not resolved. Sincere thanks to all for the comments you leave - I really appreciate it!